This example shows how to calculate the deflection of a structural plate acted on by a pressure loading. and E is the modulus of elasticity, ν is Poisson's ratio, and h is the plate thickness. The transverse deflection of the plate is w and p is the pressure load. The boundary conditions for the clamped boundaries are w=0 and w′=0 where w′ is the derivative of w in a direction normal to the boundary. The Partial Differential Equation Toolbox™ cannot directly solve the fourth order plate equation shown above but this can be converted to the following two second order partial differential equations. which is the form supported by the toolbox. The input corresponding to this formulation is shown in the sections below. Create a pde model for a PDE with two dependent variables. For a single square, the geometry and mesh are easily defined as shown below. 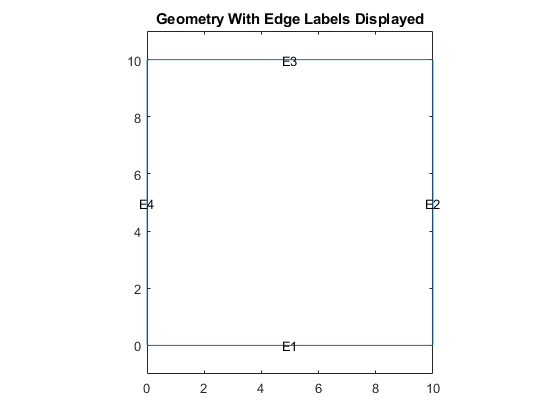 Plot the geometry and display the edge labels for use in the boundary condition definition. The documentation on PDE coefficients shows the required formats for the a and c matrices. The most convenient form for c in this example is nc=3N from the table where N is the number of differential equations. In this example N=2. The c tensor, in the form of an N×N matrix of 2×2 submatrices is shown below. The six-row by one-column c matrix is defined below. The entries in the full 2×2 a matrix and the 2×1 f vector follow directly from the definition of the two-equation system shown above. Define distributed springs on all four edges. The solution is calculated using the solvepde function and the transverse deflection is plotted using the pdeplot function. 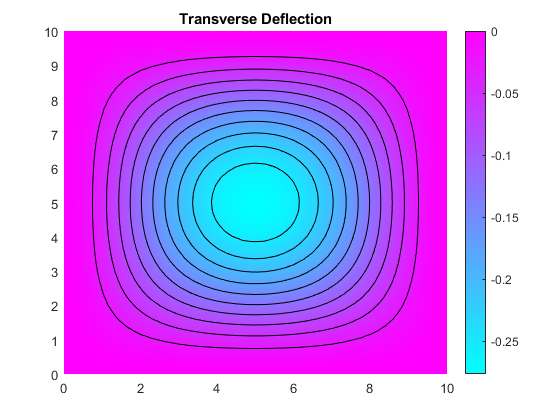 For comparison, the transverse deflection at the plate center is also calculated using an analytical solution to this problem.